This all came to an end when my parents split up. That’s certainly how it was in my family, especially after my father forced us out of his home. He had padlocked the house except for one entrance and hired men to watch over my mom and her family scramble to get our things. To make things even more chaotic, he also hired a gang of people to quite literally take the roof off so that my mom only had a few hours to take out 17 years’ worth of belongings. To say that it was traumatizing is an understatement. I hope that no one ever has to experience holding a thirteen year old boy having a trauma-based anxiety attack while trying to disguise the fact that his attack was causing you to have one, too. How do you celebrate the season when there’s not much to celebrate over? When your family is still negotiating the meaning to the word “family?” The quick answer is you don’t. Trying to muster up any holiday cheer is like trying to wring out the last remnants of liquid from a dried out wineskin. For the first few years after the split up, I used to dread Christmas. 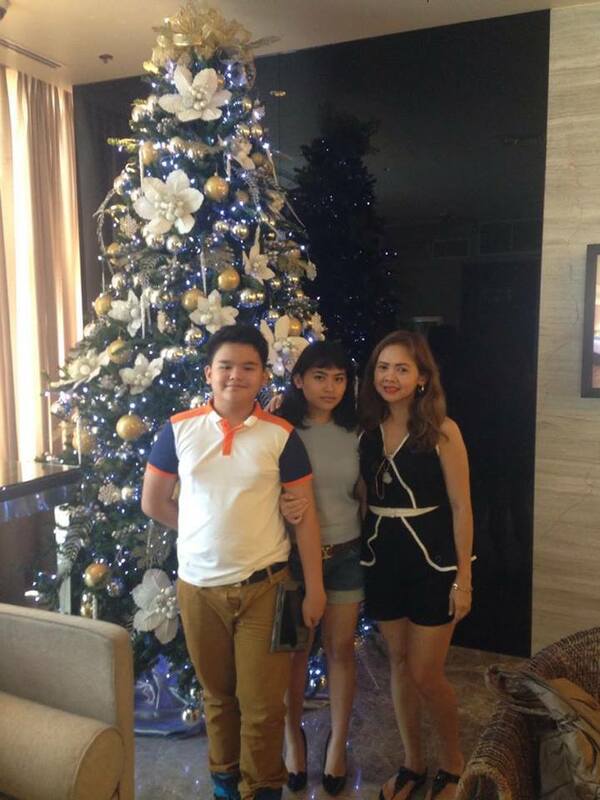 Since I was in college in Metro Manila and my family was in Mindanao, Christmas and summer vacations were the only times I get to see them. It’s the same experience a lot of university kids from the province face, except most of them would look forward to coming home. I used to be really jealous of my dormmates who could talk happily about going home for the holidays. Or, really, just be jealous of anyone who’d be excited about Christmas. I’d tack on a smile when people would ask about me if I was excited about coming home, too. I knew I felt differently, but I didn’t want to look different. Christmas meant coming home to my mother and her new apartment. It meant taking a bus with my brother to see my father for a few days. It meant having to sit through him trying to needle us out of my mother’s grasp, poisoning us with stories about my mother. One time, he sat my brother and I down at his office and read us the minutes of the annulment, in which he called my mother a narcissistic whore. Nice try, dad. Except that it worked for a bit on my brother the first time, and my brother was despondent for a few days. Christmas meant a suicide attempt while my brother and my mother went to church, and having to vomit out a bottle of cleaner that night. Fortunately, my Christmases are more peaceful now. My family has settled in to a comfortable groove, I think. We’d buy groceries on the 23rd or 24th, and order take out from our favourite chicken place. 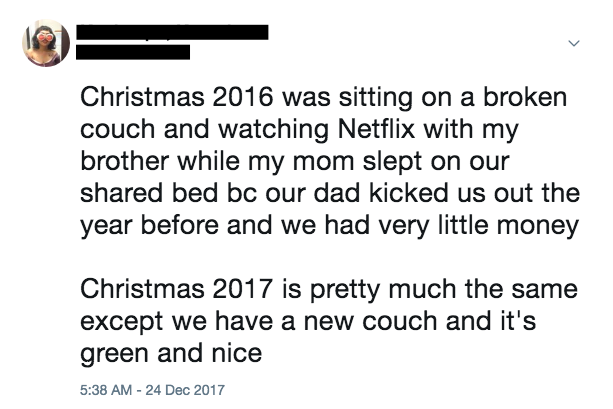 On the night of Christmas Eve, my mother would let us eat inside the living room, and we’d maybe even put on a Christmas movie on Netflix, not really celebrating the season so much as acknowledging its existence. Later, my mother would go to sleep, and my brother and I would stay up to watch a show. Last year, we watched the entire season of American Vandal. It seemed appropriate enough. I don’t think I’ll ever truly celebrate Christmas again. It’s an isolating time for anyone who doesn’t fit into the traditional two parent family structure, especially when the family structure that you do have is toxic. Or even if you’re just sad–the season hijacks your emotions and you’re not allowed to feel anything that isn’t 100% happiness unless you want to be a grinch. It’s not really an inclusive holiday, no matter how many people try to paint it as so. Still, I appreciate that it’s a comforting time for other people, and the idea of a “season for giving” is a noble one. I just wish it was as comforting for me, too.